I was so excited when we got these super adorable take along crayon sets for my kids that I wanted to give it to them right away! Together with the sketch pads, they made the perfect travel kit for our 5 hour road trip. I love that they are a fun shape – a blue truck case for my son and a pink princess one for my daughter. They come with non-roll crayons that are triangular in shape – so much easier than the round type that are constantly falling down. The best part is that the total price for all four is right around $10! My kids had a blast playing with them. I even made some fun pages for my son to do inside the mini sketch pad. For example: bubble letters of his full name to color, a house outline for him to detail (just a square with a triangle on top), and other coloring activities. My 1 year old entertained herself with her pretty princess crayon set by taking the crayons in and out and opening and closing the lid. 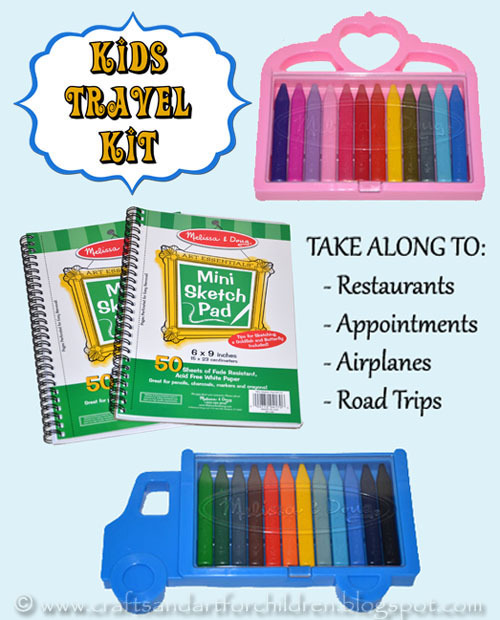 The crayon sets and mini sketch pads make a great travel kits for restaurants, appointments, airplane travel, road trips, or anywhere else you might be headed and need something to entertain the kids. We even used ours as a quiet activity for both kids to do during church. « Pom Pom Caterpillar to Butterfly Craft – so cute!